Let me begin by saying that I hope you and your family had a wonderful Christmas holiday and that Santa was good to you. What a productive day I had today. I enjoyed some quality beauty sleep til around eleven, which did my body good. Then I spent two hours at the gym working hard. I tried a lot of the exercises in my program design, but still lacked motivation. I really just need a workout partner. Things always go faster when I have someone to talk to. I went home for a nice nap, and headed back to Fort Sanders for our weekly nutrition meeting. Tonight’s topic was in the format of a support group, so we basically sat in a circle and talked. To my luck, three fellow team members were also in attendance, so I was glad to have the opportunity to talk to them for a bit. Following the meeting, I went back to the fitness center and put in another hour of working out. I did mostly cardio, but incorporated some ab work and strength training too. The wonderful picture above was my dinner this evening. You did not know I was the Rachael Ray of Knoxville, did you? The recipe was super easy. All I did was thaw a chicken breast, rub it with some Mrs. Dash spices and seasoning (the sodium free versions), and threw it in a heated pan on the stove top. Five minutes later and I had a delicious chicken dinner. 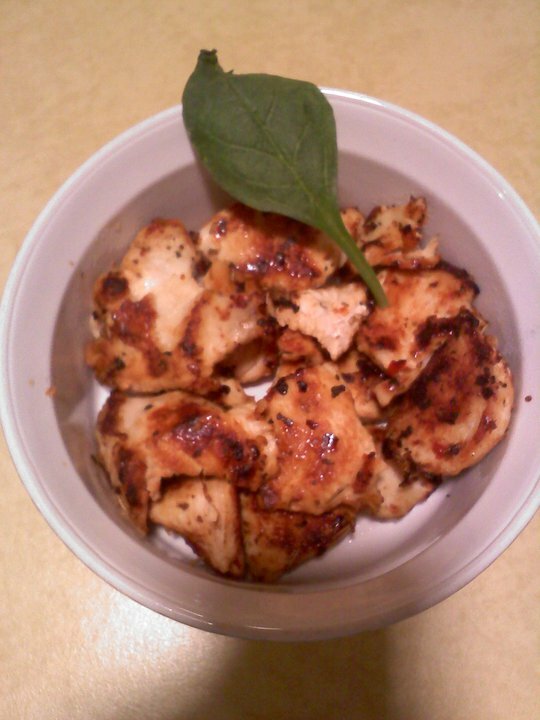 The spices really gave it a kick so it was not just your ordinary bland chicken. The best part? It was actually healthy and filling. I’m gearing up for my big new year’s day 5k this Saturday. I competed last year and finished in over 37 minutes. I am looking to finish in about 33 minutes this year. Wish me luck.